Welcome to the December Release Week at Taylored Expressions! Taylored Exprsessions is celebrating Release Week with some fabulous giveaways!! Visit the TE BLOG each Sneak Peek Day this week for details on how you can enter to win!!! Welcome to Release Day at Taylored Expressions where all the items you have seen this week on everyone's sneak peeks are available at the TE store for your crafting pleasure! 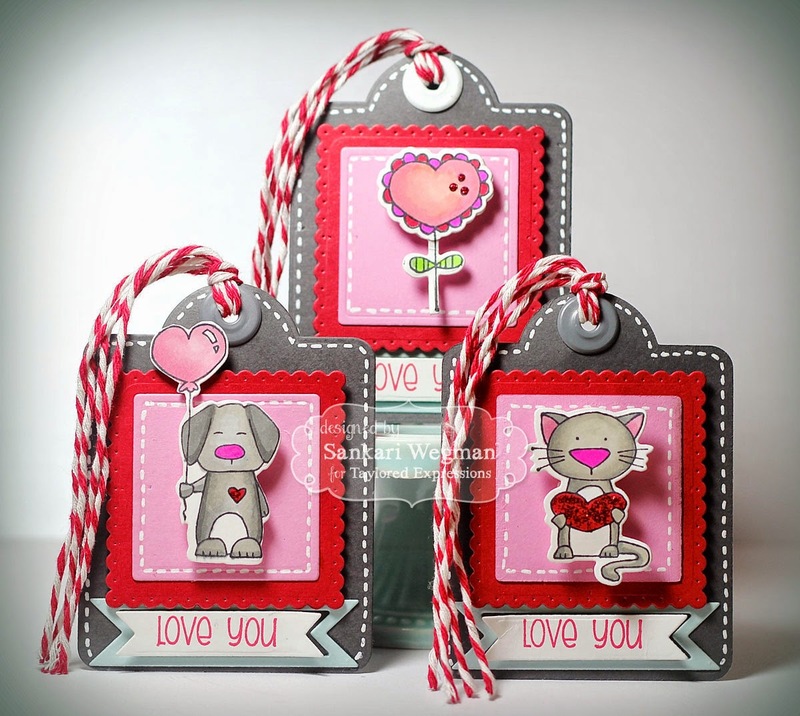 Today, I am so excited to show a project that I made using the Tag-Along Valentine stamp set with coordinating Tag-Along Valentine's Day dies! 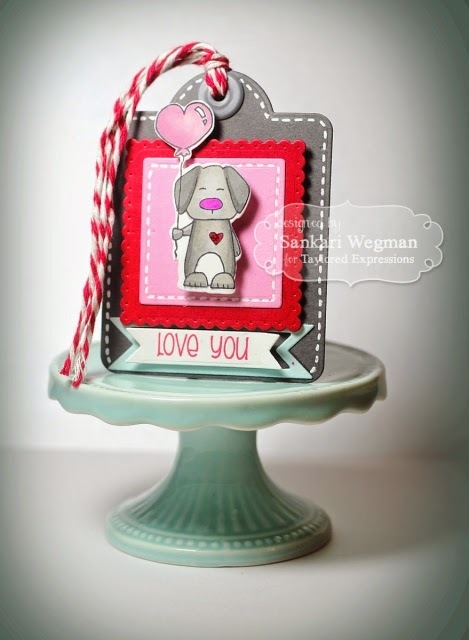 I made a set of cards with these cute stamps and dies using the newest Build A Tag 2 die set that easily allows you to assemble and create a set of tags! LOVE it! Check out these super cute stamp images in this stamp set- love that cutting them out is so easy with the coordinating dies! 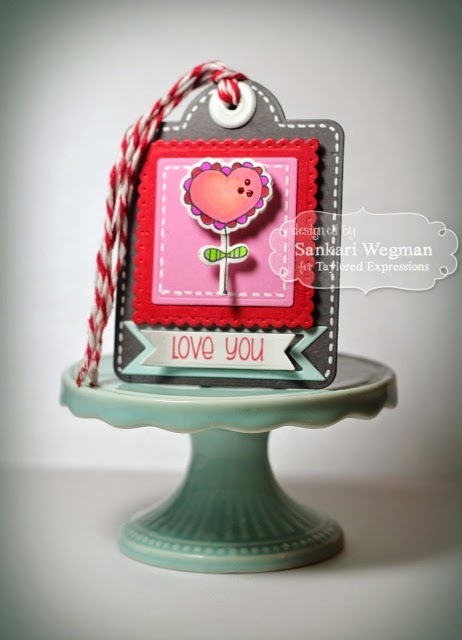 I started out by using the Matched Kit: Formula for Love that has premium cardstock that is heavy and cuts and holds up so nice! I die cut out the base in the Poppy seed gray and then die cut the red and pink pieces and assembled it onto the base with a bit of dimensionals. 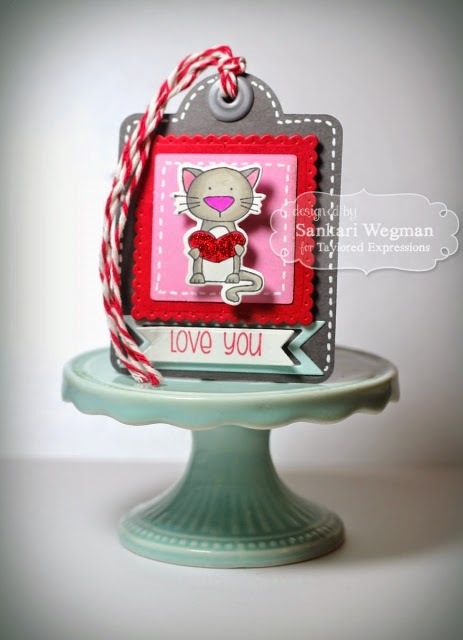 And then I stamped each of the images and colored and then cut them out with the coordinating dies - here is the cute little kitty in this stamp set - isn't she just the cutest?! My favorite might be this little guy holding the heart shaped balloon - SO cute! I love that the die cut allowed the cut on the balloon so effortlessly! I added a jumbo eyelet to each tag and then some baker's twine along with the sentiment: Love You to the sentiment flag that comes with the Build A Tag 2 die set - so fun! I loved making these tags and can't wait to see what everyone has made with these super cute dies, stamps and papers for today's release!!! Please head over to the TE Blog for more details! These are so cute Sankari. Love the layers, the darling images... the doodle/stitched lines look great. The tags are adorable. Just love them.